I remember once asking my new Christian friends why – if Jesus is The Way and his Good News is all we need to hear – then why bother with the Old Testament at all? Who needs to know all that old stuff if the Gospels and Epistles have all the information we really need? It seemed to my novice ears that this was precisely what the apostle Paul was saying. Besides, there are so many glaring inconsistencies between the Old and the New Testament’s messages. The typical response was that the Old Testament clearly predicted Jesus’ coming as Messiah. This made the Hebrew Scriptures an important source of evidence for Christian apologetics. As far as any inconsistencies go, well they weren’t really inconsistent. There was just a change in the way God related to us, now that Jesus had made everything right with his death and resurrection. And after all, the Old Testament was still the Word of God. Just incomplete. Anyway, I don’t struggle with that stuff anymore. I think the Hebrew Scriptures (the term “Old” Testament is so…condescending ) are very important for Christians to study. All of the Hebrew scriptures, not just those found in our Bibles. We totally screw up when we forget that Jesus was a Jew, living in Palestine with other Jews, and most of these scriptures (no Bible yet, remember) were the source of his theology and his cultural traditions. And it doesn’t help when we exclude Jewish interpretations of their own scriptures, either. I no longer struggle with trying to square the apparent inconsistencies between the angry, violent and vengeful Yahweh with the forgiving and merciful Father of Jesus (even though the Hebrew Prophets presented us with much the same portrait of God as Jesus did ). I simply no longer believe that any of the scriptures, old or new, are the Word of God. They are not inerrant nor are they infallible. They were written by men (and maybe women) who were certainly ‘inspired’ to come to some sort of understanding of God, but they were not God’s secretaries taking divine dictation. And they do not always paint God in a favorable, or accurate light. It’s when we try to take literally all the words found in the Christian canon, on face value and without any historical context, that our problems begin, whether we are orthodox, heretic or atheist. I didn’t realize it then, but in some ways I was a Marcionite. 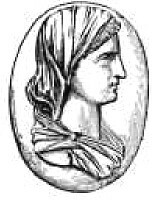 Marcion of Sinope (ca. 85-160) was an early Christian thinker who also had problems squaring the Hebrew Scriptures with the Gospels and especially with Paul’s Epistles. He could not accept the idea that the loving “Father” that Jesus prayed to was also the angry Yahweh of Hebrew scriptures. So he came up with an alternative theology, one steeped in Greek philosophy and mythology, in which Yahweh is the flawed creator god, subordinate to the ultimate (and good) deity: God, the Father of Jesus. According to Marcion, Jesus comes from the Father to redeem the walking dead from the clutches of Yahweh and the misery of this corrupt world. In this way Marcionism is similar to Gnosticism. (For a nice movie parable watch “ The Matrix” trilogy.) Marcion composed what is probably the first Christian canon, the first compilation of Holy Scriptures, but they contained only a syncretized form of the Gospels and the letters of Paul. Paul’s epistles were the primary source of his theology and it is Marcion who first placed them in an anthology. Now, with all due respect to Rey (who got me to thinking about Marcionism) I do believe that, in this case, those church fathers who ended up as history’s Christian victors were right to label Marcion a heretic. Of course, they were begging the question because there was no such thing as orthodoxy at the time– there was no Christian consensus on doctrine or dogmas – there were none of the creeds Christians recite today. In fact, the first creeds were likely written and imposed in response to Marcionism, which had a great following. Now, I don’t think that the Church’s surviving theology is altogether that faithful to the teachings of Jesus either. But there is little, I think, in Marcionism to commend it to someone who wants to follow Jesus. Because Jesus without Judaism is not Jesus at all. It is something completely different. -To this day Paul has an inordinate amount of influence on the Church’s doctrine. -Throughout the Church’s history there has been a tendency to place our focus on another, better realm that await us beyond this fallen and depraved world. -Our fixation on a battle between good and evil, between God and Satan, is reminiscent of the dualism found in Marcion and Gnostic theologies. -And, of course, the Church has tried it’s best take the Jewishness out of Jesus (and make villains out of the Jews – some believe that it was the Church’s repressed Marcionism that helped fuel the dogma of Hitler’s ‘Final Solution”). As outlandish as Marcion’s theology may sound to us today, who have known nothing other than modern Christian ‘orthodoxy’ (the theology of the victors), does it really sound any more outlandish than the concept of a triune God? (Try asking your Jewish or Muslim friends that question.) Again, the problem seems to lie within the combined ideas of Biblical literalism and inerrancy. A more relaxed, though possibly just as devout, reading of scriptures can solve this problem and, in my experience, help immensely with one’s understanding of God. It was the cognitive dissonance caused by trying to believe contradictory ideas, ideas not just found in a literal reading of the Bible but ideas thought up by theologians in their attempts to square their own contradictory readings of scriptures, that had me doing the same thing that the ‘orthodox’ had already done and continue to do: embracing heresy to prove orthodoxy. This entry was posted on May 19, 2010, 3:24 pm and is filed under biblical literalism, Christianity, Faith, Gospel, Heresy, Heterodoxy, History, Jesus, Orthodoxy, Religion, Spirituality, Theology. You can follow any responses to this entry through RSS 2.0. You can leave a response, or trackback from your own site. Interesting. I had not heard of Marcion. So he was one of the first to elevate Paul’s letters to the Word of God. Yeah. I’d read about him before but Rey’s website piqued my interest, do I did a little more digging. Interesting, and only one of many, many different Christianities that most of us don’t know about. Trinity—I’ve long ago given up any attempts to understand it—but it is curious, some Christians say this thing called “The Word” is God and Son of God ?—-but its not mentioned as part of the Trinity………Then, in the RC Church, there is also “Mother of God” ? (Mary(pbuh))…….but the development of Christianity is very fascinating. The Christological debates (“nature of Christ”) around the 7th century are interestingly confusing too. Right, and in Marcionism it is not man who is sinful but Yawheh. Now, we know that God is perfect and incapable of sin, right? Yet through out the Hebrew scriptures we get a somewhat different picture, a somewhat ‘imperfect’ god who does things that, if man were to do them, would be called sinful. This is only the case if you take all the scriptures as fact, not at times metaphorical and at other times man projecting his personality onto what earlier (primitive?) men thought was God’s nature. I just put up a post about Crypto-Marcionism in the Old Testament prophets, or at least something tending in the Marcionite direction sort of below the surface in parables in the OT that attack the view of God found in earlier parts of the OT. Also, I just want to say here that Marcionism actually placed all the culpability for Jesus’ death on Yahweh not the Jews. The ‘orthodox’ in order to combine the OT god and Jesus’ Father into one had to remove that culpability from him, and so they invented the statement in Matthew “His blood be on us, and on our children” and moved the culpability from Yahweh to the Jews so they could make Yahweh merge with Jesus and then say not only that the Jews killed Christ but that they killed their own God. None of that foolishness would fly in Marcionism. In fact in the gospel of John there are a few Marcionite-like sections left in which a character is referenced several times called “ruler of this world” of whom Jesus says “now is the ruler of this world judged” and again when Judas is coming “the ruler of this world approaches” (Satan being in Judas at this point) and finally to Pilate when Pilate says “don’t you know I have power to crucify you?” Jesus says “you would have no power to kill me unless it was given you from ABOVE and therefore HE that delievered me to you has the greater sin” obviously the ABOVE and HE here being not the Father but the “ruler of this world” character, for the very one who gives the authority to kill Jesus is the one on whom the culpability is said to rest. Good point. Of course these prophets predate Marcion by a few centuries but I see what you mean, and agree. God was definitely evolving, becoming more moral, as time the centuries pass. But the prophets don’t really see two Gods, rather they just seem to see a new nature in God. Of course that can’t be, because God is immutable right? (Well, maybe). But perhaps it’s not God who changed but the perspective of the people, who were evolving morally, who changed. Check out Robert Wright’s book “The Evolution of God”. But of course he could easily be referring to Yahweh as well. Even though I think it is significant that Jesus refers to God as Father and not Yahweh. Certainly this no accident. IMHO, I think Jesus is making a point about the nature of God as he sees him/her (which the prophets were beginning to see) and the incomplete/incorrect/false nature of God/Yawheh as described in the Pentateuch. And, I never wanted to suggest that the Nazi’s were Marcionites. Hitler, Goebbels, Himmler et al were not Christians of any sort. But…the people who voted for them, the ones who turned a blind eye to the holocaust, or even assisted in this atrocity were Christians. At least that’s what they called themselves. In fact, that’s one of the main things that identified them as not-Jewish. I think that the roots of anti-Semiticism (anti-Judaism) are firmly planted within the church. I think that the innocent attempt to separate the new faith from it’s Jewish origins, which Marcion was certainly in tune with and perhaps the originator of, was the beginning of a general disdain for the Jews, a disdain that grew into contempt and hatred for many Christians. See, the Jews (and most Christians) still see Yahweh as God, so to say that Yahweh is tantamount to Satan (who IMHO is a fiction) is on par with saying that Jews are worshipers of the Devil. Which is precisely the charge levied against Jews throughout much of Christian (and, I think, at times, Muslim) history, even up to very recently. So if good, law abiding Christian people can think this way, in the privacy of their homes and pubs (or beer stubes or cafes) then it certainly made Hitler’s job easier. First, saying someone worships the devil is not equivalent to saying they should be killed because assuming your religion doesn’t also worship the devil then you wont go around killing people who disagree with you. Second, modern Jews don’t really follow the Torah (except maybe the ultra-‘orthodox’) and most in ancient times didn’t either. Really Judaism has become more a secular system of ethics with some metaphyisical jargon. It is only ‘orthodox’ Christians who really believe this stuff in the Torah. The true devil worshipers are Calvinists not Jews. Besides this, I think if you were to look at it from a historical perspective while believing that Yahweh really exists you’d have to come to the conclusion that when he had the Romans destroy the temple Yahweh essentially abolished his own connection with Judaism and went in search of creating a new religion, and he made two: Christian ‘orthodoxy’ and Islam. And these two religions are the ones that have been filling the world with violence ever since, just as Judaism had done before. Although it was commanded in Deuteronomy 13 that you kill your children if they try to leave the religion it isn’t Jews who do this, but Muslims. And when it comes to stoning blasphemers in accordance with Moses’ Law only Muslims and Calvinists really support that as far as I know. My explanation for this is that ‘orthodoxy’ is an artificial construct built up around ‘heresy’. This case has been made in the past not only by amateurs like me but by respected scholars. Walter Bauer’s Orthodoxy and Heresy in Earliest Christianity is a good example. (It can be read online here.) Another example is the very modern book by Joseph B. Tyson, Marcion and Luke-Acts: A Defining Struggle which presents a good case for both canonical Luke and the book of Acts as being written in response to Marcion. I can’t really argue with that assessment. I don’t think the Jews even started considering the concept of monotheism until Moses and then it took them many centuries to accept it. The scriptures point this out all the time. I think that there is a tendency of all religions to evolve from polytheism to monotheism. Even the apparently polytheistic Hindu faiths are said by many to be actually manifestations of true monotheism. Couldn’t that be said of Marcionism as well? That there is only one ‘true’ God, worthy of worship and that the other two subordinate beings, are, though powerful, not “god”? Jesus told the Pharisees that they did, in fact, worship their father, the devil. And, to my understanding, in refuting thier understanding of Yahweh, Jesus claimed to be “I AM.” And that was the blasphemy right there–that a man who redefined their laws claims to be the true “Yahweh” (as they say.) How many times does Jesus call the scriptures “their’s”? And what of Paul claiming the law was mediated by angels? (Not God?) And that Jesus “disarmed” the god of this world? I am just not sure which way to “lean” and this discussion brings to light the very 2 issues I am struggling with. I don’t understand how to read the Bible anymore, or whether to “trust” Paul…. But, I will say, I follow alot of what is stated in the “Creed.” Jesus is present among the least of these, He sides with the victims of all time (Renee Girard), He was the sacrifice to end sacrifice once for all…and yet we still shed blood over sin when it’s been dealt with once for ALL. We are ministers of reconciliation, in that God overlooked sin. The gospel is that all are forgiven, right? What resources do you have in helping me understand the textual criticisms of hell? Of “OT” vs “NT” and of the god of this world still working in the religious systems to enslave? It is an interesting journey isn’t it? Once you pull your boots out of the muck of fundamentalism? I’m still learning myself, more and more each day and fully never expect to stop. Thanks for stopping by. I hope you continue to do so.